The Hail Mary or Ave Maria (Latin) is a traditional Christian prayer asking for the intercession of the Virgin Mary, the mother of Jesus. In Roman Catholicism, the prayer forms the basis of the Rosary and the Angelus prayers. In the Eastern Orthodox and Eastern Catholic Churches, the prayer used often in formal liturgies, both in Greek and in translations. It is also used by the Oriental Orthodox churches as well as by many other groups within the Catholic tradition of Christianity including Anglicans, Independent Catholics, and Old Catholics. Some Protestant denominations also make use of the prayer. In American football, a "Hail Mary pass" is a forward pass made in desperation (on a prayer), with only a small chance of success, usually attempted near the end of a game where there is no probability for any other play to score points. 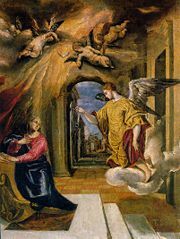 The biblical basis of the Hail Mary prayer relates to the angel Gabriel's Annunciation to Mary of Jesus' imminent conception and birth just before she leaves Nazareth for the home of Zechariah and Elizabeth. The angel declares: "Hail, full of grace, the Lord is with thee, blessed art thou amongst women" (Luke 1:28) and "blessed is the fruit of thy womb" (Luke 1:42). The opening word of greeting, χαῖρε, chaíre, literally has the meaning "rejoice" or "be glad." This was a normal greeting in the Greek language in which Luke's Gospel was written and continues to be used in the same sense in modern Greek. The word κεχαριτωμένη, (kecharitōménē), translated as "full of grace," can be translated in various ways. Grammatically, it is the feminine present perfect passive voice participle of the verb χαριτόω, charitóō, which means "to show, or bestow with, grace." The Hail Mary prayer of the Eastern Orthodox Church and Eastern Catholic churches is translated as: "Mother of God and Virgin, rejoice, Mary full of grace, the Lord is with thee. Blessed art thou amongst women, and blessed is the fruit of thy womb, for thou hast given birth to the Savior of our souls." "Hail Mary, full of grace, the Lord is with thee; blessed art thou among women, and blessed is the fruit of thy womb, Jesus. Holy Mary, Mother of God, pray for us sinners, now and at the hour of our death. Amen." The first is the older, and remains in use by the Old Believers as well as those who follow the Ruthenian recension (among them the Ukrainian Greek-Catholic Church and the Ruthenian Catholic Church). The second appeared in 1656 under the liturgical reforms of Patriarch Nikon of Moscow, and is in use by the Russian Orthodox Church, the Serbian Orthodox Church, the Bulgarian Orthodox Church and the Ukrainian Orthodox Church). Traces of the Hail Mary have been noted in a Syriac ritual attributed to Severus, Patriarch of Antioch (c. 513), as well as to Pope Gregory the Great (c. 540-604) and John of Damascus (c. 676–749). However, the Catholic Encyclopedia admits that these examples do not warrant the conclusion that the Hail Mary was used as a specific formula of Christian devotion. It states that "there is little or no trace of the Hail Mary as an accepted devotional formula before about 1050." Thomas Aquinas (c. 1225–1274) indicated that the prayer was in use in his time, with only the word "Mary" being added to the greeting of the angel Gabriel. Slightly later, the name "Jesus" seems to have been added to specify who was meant by the phrase "the fruit of thy womb." Rosary beads: the prayers of the Rosary consist of repeated sequences of the Lord's Prayer followed by ten recitations of the Hail Mary and a single recitation of "Glory Be to the Father." 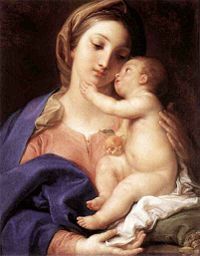 Even the earliest Western forms have no trace of the phrases "Mother of God and Virgin" or "for thou hast given birth to the Savior of our souls," which are part of the Greek version. 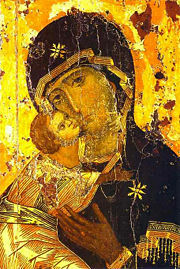 The term "Mother of God" (''theotokos'') was particularly important in Eastern tradition as a guard against the "heresy" of Nestorianism, which affirmed Mary as Mother of Christ, but not Mother of God. We render to God the highest praise and return Him most gracious thanks, because He has bestowed all His heavenly gifts on the most holy Virgin… the Church of God has wisely added prayers and an invocation addressed to the most holy Mother of God… We should earnestly implore her help and assistance; for that she possesses exalted merits with God, and that she is most desirous to assist us by her prayers, no one can doubt without impiety and wickedness. The Hail Mary is the essential element of the Rosary, a prayer method in use especially among Latin Rite (Western) Catholics. This tradition appears in the East only among Latinized Ukrainian and Maronite Catholics. Anglicans also employ the Hail Mary in devotional practice. Traditional Anglo-Catholics use the prayer in much the same way as the Roman Catholics, including use of the Rosary and the recitation of the Angelus. Many Anglican churches contain statues of the Virgin Mary, and the faithful use devotional prayers including the Hail Mary. However there might be some variations in local usage, reflecting the differing theological leanings of the two bodies. The Hail Mary or Ave Maria in Latin has been set to music numerous times. Among the most famous settings is the version by Charles Gounod (1859), adding melody and words to Johann Sebastian Bach's first prelude from the Well-Tempered Clavier. Antonín Dvořák's version was composed in 1877. Another setting of Ave Maria was written by Giuseppe Verdi for his 1887 opera Otello. Russian composer César Cui, who was raised Roman Catholic, set the text at least three times: As the "Ave Maria," op. 34, for 1 or 2 women's voices with piano or harmonium (1886), and as part of two of his operas: Le Flibustier (premiered 1894) and Mateo Falcone (1907). Settings also exist by Mozart, Byrd, Elgar, Verdi, Saint-Saens, Rossini, Brahms, and Perosi as well as numerous versions by less well-known composers, such as J.B. Tresch. 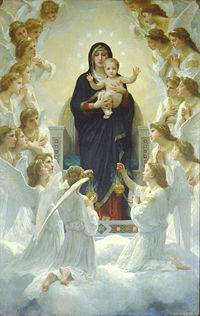 Virgin and Angels by Bouguereau, an example of Marian art. In Slavonic, the text was also a popular subject for setting to music by Eastern European composers. These include Rachmaninov, Stravinsky, Bortniansky, and several others. This text was also very often set by composers in the Renaissance, including Jacques Arcadelt, Josquin Desprez, Orlando di Lasso, and Giovanni Pierluigi da Palestrina. Since prior to the the Council of Trent there were different versions of the text, so the earlier composers in the period sometimes set versions of the text different from the ones shown above. Josquin Desprez, for example, himself set more than one version of the Ave Maria. The most famous musical use of the words Ave Maria is Franz Schubert's Ellens dritter Gesang (D839, Op 52 no 6, 1825). Ironically, this work does not actually include the Hail Mary prayer, but only the greeting "Ave Maria" ("Hail Mary"). The original text of Schubert's song is from Sir Walter Scott's The Lady of the Lake and was translated into German by Adam Storck. Adding to the confusion, the traditional Ave Maria prayer is often sung to Schubert's melody. In Walt Disney's Fantasia, the tune is used with yet another text beginning with the phrase. Ayo, Nicholas. The Hail Mary: A Verbal Icon of Mary. Notre Dame: University of Notre Dame Press, 1994. ISBN 9780268011017. Carroll, Michael P. The Cult of the Virgin Mary: Psychological Origins. Princeton, NJ: Princeton University Press, 1986. ISBN 978-0691094205. Longchamp, Henri de. Hail Mary. Montreal: Dominican Centre, St. Jude's Shrine, 2001. ISBN 9782980658556. McKenna, Megan. Praying the Rosary: A Complete Guide to the World's Most Popular Form of Prayer. New York: Doubleday, 2004. ISBN 9780385510820. This page was last modified on 25 July 2017, at 21:03.